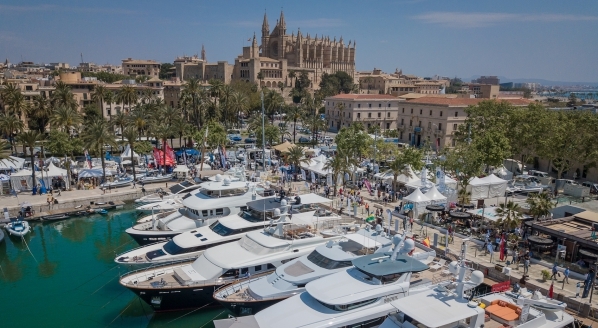 As the countdown to the Monaco Yacht Show (MYS) turns from months to days – and equanimity turns to blind panic for those exhibiting – SuperyachtNews takes a closer look at some notable exhibitions and brokerage market opportunities that are making their way to Port Hercules for this year’s show. As with every year, show management has served up a feast – superyachting’s crème de la crème . 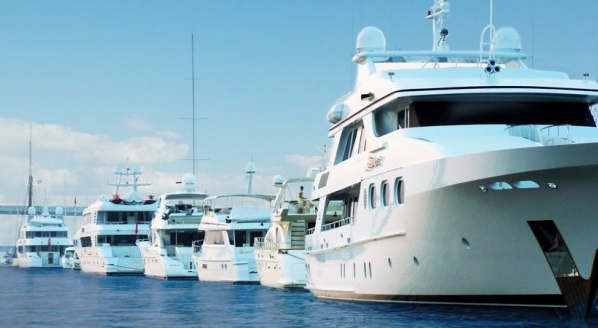 Whether clients are scouring the docks for the best brokerage deal in sight, or conducting field research into the latest superyacht designs, gizmos and gadgets, the Monaco Yacht Show has it all. 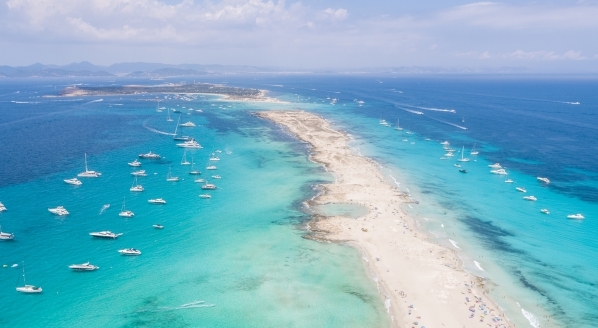 In this article, we condense the 125-yacht fleet in attendance into a shortlist of ‘must sees’, listed by virtue of their design and stylistic features; blistering performance; shipyard and word-of-mouth reputation; or attractive pricing, among other considerations. The yachts, descending by LOA, are listed below. As one of the most progressive yards in the market, a late Feadship delivery is always worth a close inspection. 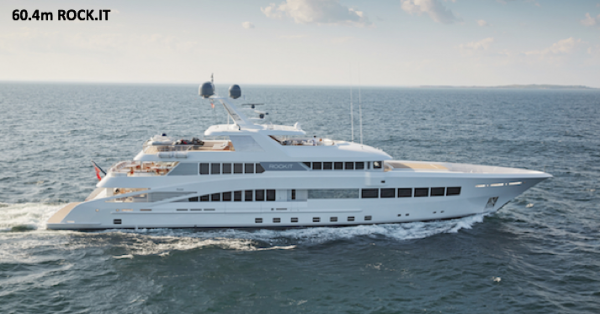 Aquarius is the fifth largest vessel delivered by the yard to-date and features the elegant interior and exterior design work of Sinot Exclusive Yacht Design. Her highlights are a 6.5m swimming pool on the main deck, which transforms into a dance floor, and an abundance of floor-to-ceiling windows; features Feadship are renowned for. 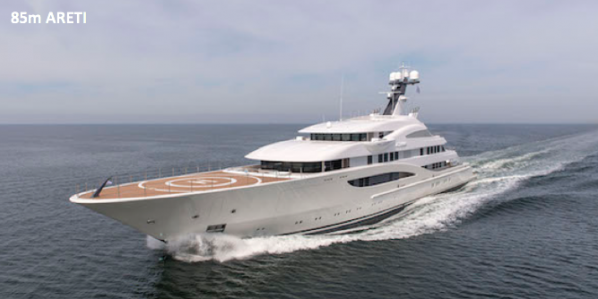 A collaboration of Lürssen and Winch Design is pretty hard to beat. Areti was delivered in July this year and at 85m and 2,850gt, she is (astonishingly) one of the smaller Lürssens to leave the yard in recent times. She is PYC compliant and has accommodation for 18 guests over nine cabins. Very little has been revealed about her interior thus far, which certainly contributes to her appeal. One of the most impressive conversion projects of all time, the former 1970s Soviet ice-breaking tug had been converted into a red explorer yacht called Giant, but was put out of action after a major fire on board. With nothing but a sooty, blackened chassis remaining, in 2014 an experienced owner saw an opportunity to transport the hull to Icon Yachts for a conversion into a luxury explorer yacht. The end result, two years later, was staggering given the complications. As of March this year, she is for sale with Fraser and IYC for €46.5 million. 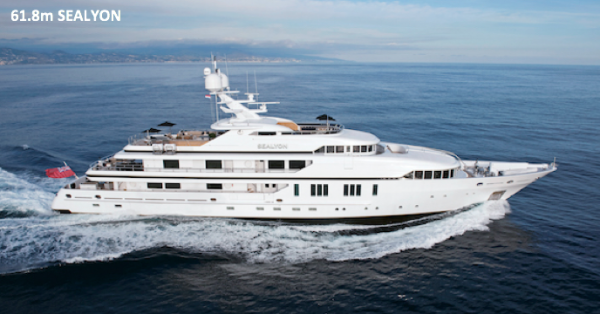 Cloud 9 was built by CRN shipyard and delivered in May this year to very high acclaim, and deservedly so. 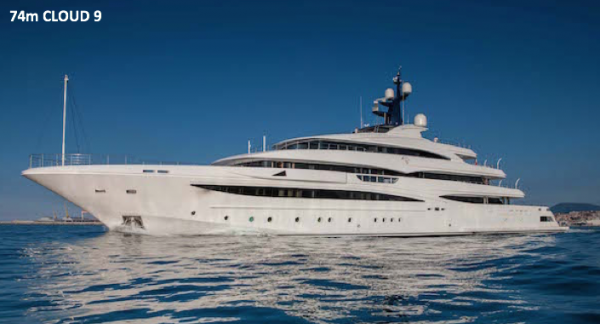 Zuccon International Project worked wonders with the exterior design: she has a widthways swimming pool on the main deck with spa jets, a Jacuzzi and Teppanyaki bar on the sun deck, as well as an excellent assortment of stylish seating areas on all decks. She also features a Winch Design-styled beach club with an espresso bar, and among many other top-spec features, an elevator accessing all decks and a helipad on the bow. Listing agents Y.CO describe the Viareggio Superyachts build as having one of the best sun decks on the water and I couldn’t agree more; it is split-level, has a rotating sun bed with misting options, a bespoke dining table that transforms into a stage, and a 12-person Jacuzzi. Her sophisticated interior, by Candy & Candy, features a notable master stateroom, raised half a level, with a walk-in dressing area and a Grigio Carnico marble bathroom. 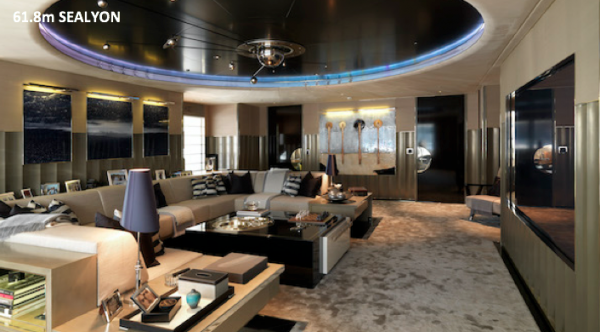 She also has an expansive media room with a 103-inch plasma screen and a rotating solar system model on the ceiling. 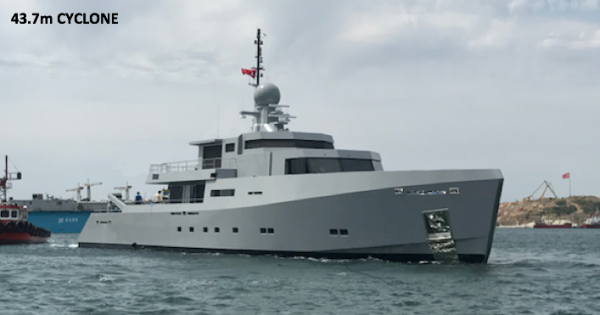 Passionate yachtsman James ‘Jimmy’ Liautaud took delivery of Rock.It in 2014 and as of March this year, she is one of the newest Feadships available for sale, at €70 million. She has a contemporary Sinot Yacht Design interior, with a main deck featuring an inordinate amount of flamed mahogany and an upper deck of a slightly lighter palette. 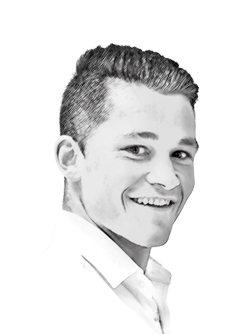 Make sure to pick up issue 181 of The Superyacht Report at the show, where we speak to owner Liautaud about Rock.It and his future in superyacht ownership. 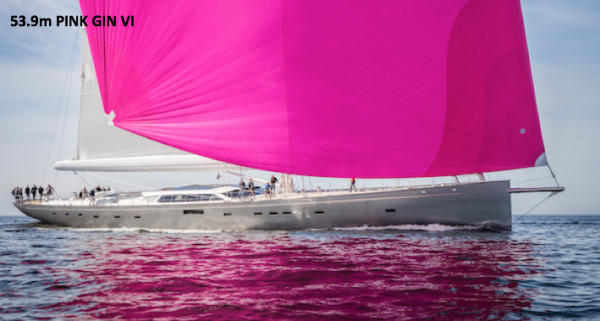 Pink Gin VI was delivered in July this year as the largest composite sloop sailing yacht in the world. She is also the first Baltic Yachts build to meet MLC crew-space requirements, which delivered several challenges for interior stylists, Design Unlimited Interior. One key on board innovation is a force feedback steering system, whereby a fly-by-wire system is used to link the helm to the rudders, and sensors transmit data from the rudder back to the wheel, giving the helmsman greater control. Moreover, the system can be tuned for different loadings and for different helmsman, depending on their feedback preference. Seven Sins is the first delivery in Sanlorenzo’s 52Steel series, which is a development from the popular 46Steel series. The voluminous aft of the main deck has a glass-bottom swimming pool, which serves as the roof of the beach club below. The beach club has fold-out balconies, a fully equipped gym, sauna and also doubles up as a drive-in tender bay, exemplifying how this area of a yacht can be cleverly utilised. She also had a lavish preview event at the Yacht Club de Monaco on 3 and 4 June this year, where the owner took delivery. Latitude stands out to me as one of the best used Benetti options for sale: she has just recently come onto the market, and at €26,785 per gross ton, she seems very fairly priced. One design feature that looks unusual at first, but actually works quite well, is the glass elevator box that pops out among the sun loungers forward on the sun deck, where one is perhaps accustomed to seeing a Jacuzzi. She has an art-deco interior style, designed by Mauro Izzo, and opulent accommodation for 12 guests over six staterooms. In April this year, Overmarine’s first all-black Mangusta 165E was launched – the 12th Maxi Open hull in the popular high-performance series – and you have to say, she is a mean looking machine and will be hard to miss on the docks. 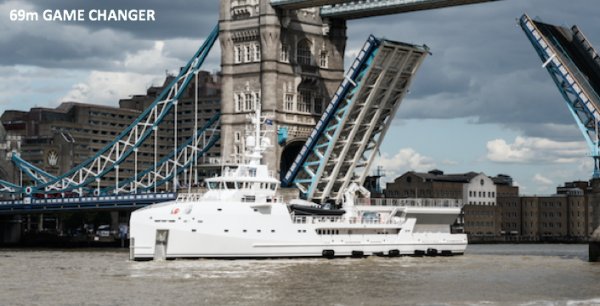 Featuring four 2,600hp MTU 16V2000 M94 engines, four Rolls Royce/KameWa NP waterjets and four Seakeeper stabilisers, she can reach a blistering maximum speed that exceeds 35 knots, offering performance on the water like no other. While Cyclone’s military styling may not be to the tastes of all, it is refreshing to see something different among the masses. 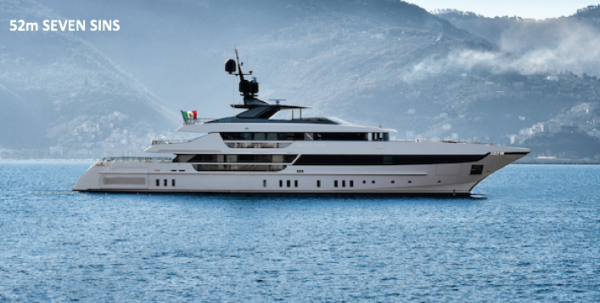 After the Italian owner of Cyclone stumbled across the 38m So’Mar at the show in 2013, the Turkish yard will have high hopes that its new flagship product will get the same reception. One enthralling feature of the boat is its library, which boasts a ceiling height of around three metres. 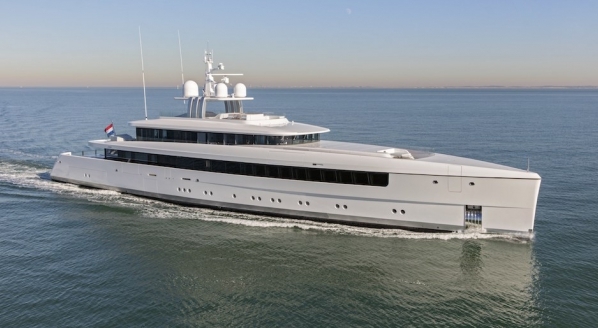 After the successful delivery of M/Y Solis in 2015, Mulder Shipyard teamed up with British Design Studio, Claydon Reeves, to build their largest superyacht yet and flagship product, Delta One. The elongated exterior lines prevent a top-heavy profile and gives the impression that the boat is longer than it actually is. The yacht features a full-height beach club, which is quite impressive and more importantly, very rare for a yacht of this size.